I arrived at Fresco on a Tuesday evening just before 6pm. The downstairs is long and narrow and would seat about 60 to 80, I would say. It is quite cozy without being cramped and is simply decorated with lots of exposed brick and a lovely copper topped bar. There is also an upper floor, which I didn’t see, and I was told that it opens only at 7pm, remains open later than the lower section, and has the same menu. I was seated right away and I noted that there were three servers covering the lower floor. All evening, the service was very prompt and courteous and the young man who was responsible for my table was clearly well versed on the various dishes being served. 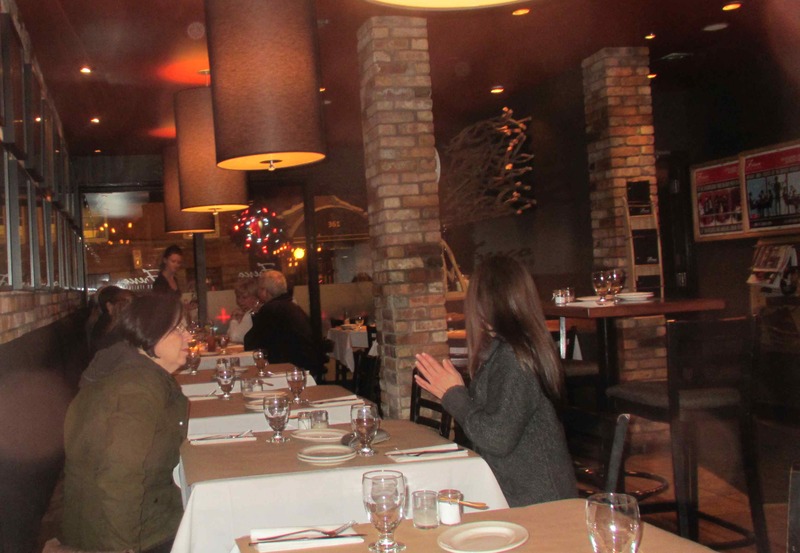 The menu itself is divided into three sections covering small, medium and large plates and is almost exclusively Italian. It is rather an eclectic and novel mix and lists only three pasta dishes and two pizza selections. 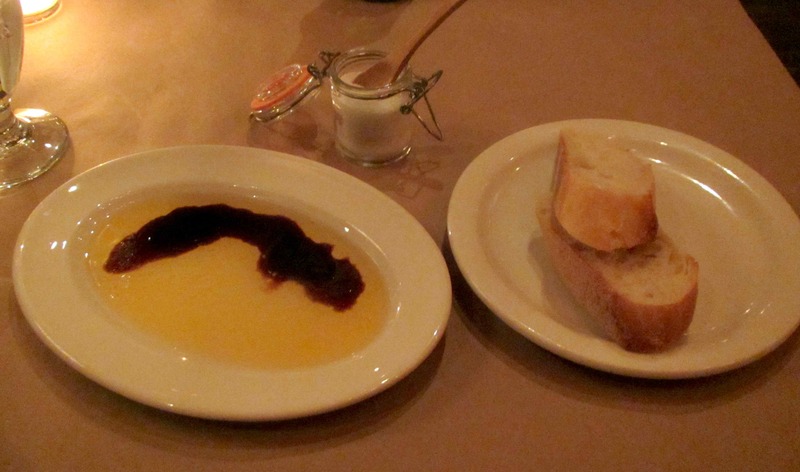 Complimentary Bread with Olive Oil and Balsamic Vinegar – The balsamic provided here was very good quality but the olive oil was nothing short of terrific and after my first couple of dips with the bread I just used the olive oil by itself. It was very fresh and earthy rather than fruity but it also had a background smokiness that was unusual but very good. The waiter told me that the chef keeps his source for this secret and I don’t blame him. I gave this simple appetizer a 5 out of 5. 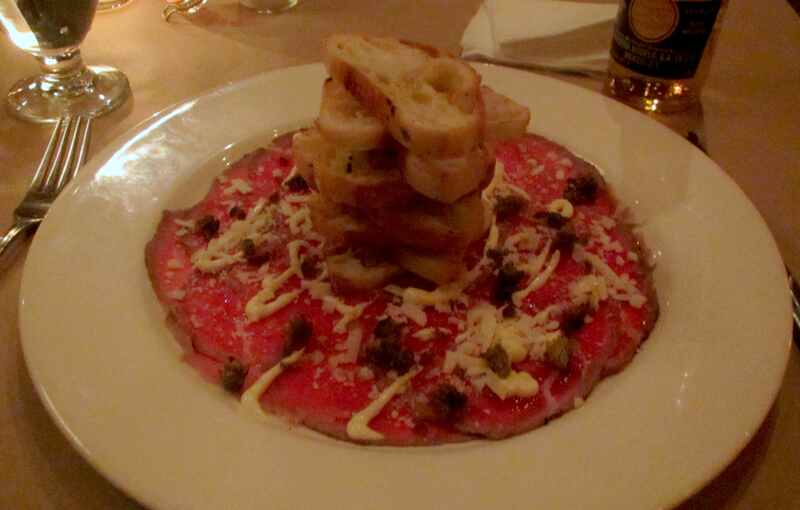 Beef Carpaccio – The menu described this as being served with shaved Romano cheese, capers, lemon aioli and crostini. The beef was sliced paper thin, cooked to a lovely pink color, and was delightfully succulent and tasty. The cheese was grated rather than shaved bit this actually worked better, I thought. The capers and aioli were nice additions but the lemon came through only in a few bites and I don’t think it would have been overkill to increase this a little. Aside from that minor criticism, I thought this excellent and gave it a 4 out of 5. 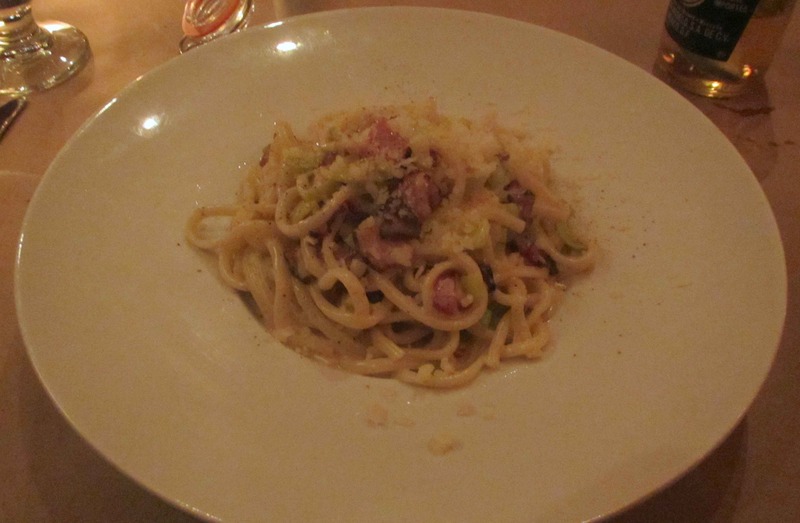 Linguine Carbonara – I have eaten many Carbonara pasta dishes in my time but this was definitely one of the best and I include my own preparations in that comparison. It was creamy to just the right degree and the pancetta, black pepper and novel addition of leek worked perfectly together. It was unfortunate I couldn’t quite manage to finish it as it was top notch and I rate it at a solid 5 out of 5. 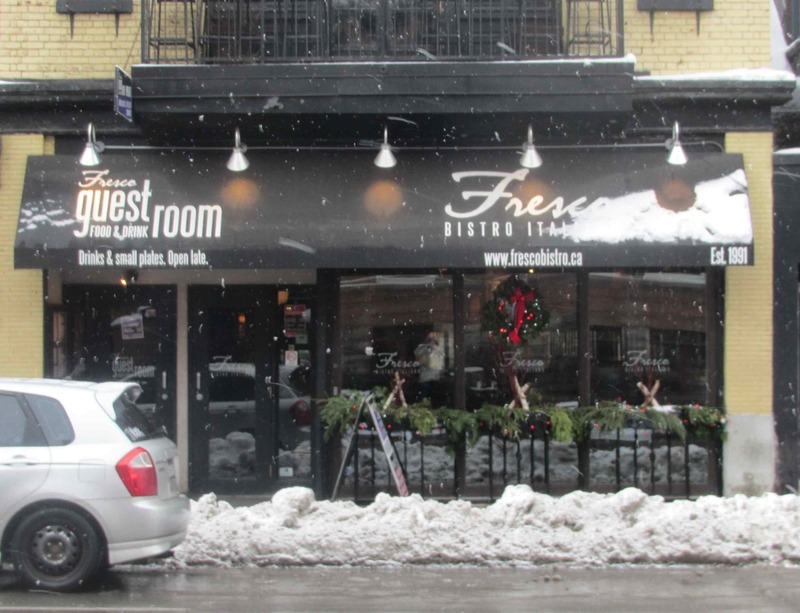 At Fresco, they clearly pay attention to service, style and presentation and do so without sacrificing anything when it comes to the quality of the dishes. The place is stylish, comfortable and well worth investigating.. I give it a 5 out of 5. Just lightly seared on the outside in the same manner as a Japanese Tataki …. the ‘cooking’ only penetrates a tiny fraction of an inch into the surface and, in the Japanese traidtion at least, the meat is ten plunged into ice water to arrest further cooking. I know Carpaccio is generally regarded as a ‘raw’ beef preparation but a light searing is not uncommon and the meat is essentially raw through most of the slices … I also seem to recall hearing of preparations where the meat is sliced when completely raw and then held under a grill for just a few seconds… haven’t seen that yet though.